In March 1995, Walt Disney Television aired a most intriguing one-hour television special on UFOs titled Alien Encounters from New Tomorrowland. This highly unusual UFO video special presents UFOs and alien visitation to our planet as a matter of fact. Though the film's existence is acknowledged by the respected website of the Internet Movie Database, you will not find it available anywhere for purchase. Those who tracked this incredible production state that it was shown only once, and with no advance notice on stations in only five US cities. Thanks to a viewer who was able to roll the VCR and capture it, we have a record of the startling statements it contained. Watch this fascinating 45-minute program at the link below. At first glance, this unique Disney TV special appears to be an elaborate promotion of a scary New Tomorrowland ride on alien encounters which was about to open at Disney World. But on closer inspection, it is much more. The entire program, which opens with a short segment by Disney CEO Michael Eisner, doesn't even question the existence of UFOs and a major UFO cover-up. At times it has a tone of ridicule towards those who still deny the existence of UFOs. Note: Don't miss the excellent UFO Information Center which is chock full of reliable, verifiable information on UFOs, ETs, and a major cover-up of the phenomenon. Key excerpts from a transcript of the UFO video special Alien Encounters From New Tomorrowland. All quotes were spoken by host/narrator Robert Urich unless otherwise noted. Remember, Disney CEO Michael Eisner and narrator Robert Urich delivered these quotes with straight, matter-of-fact, totally serious cadence and inflection, as you can see in the video we've posted at the link above. Disney CEO Michael Eisner [standing in front of a military hangar, guarded by armed troops]: Tonight we celebrate the New Tomorrowland at Walt Disney World in Florida with a television special that's out of this world. Hello, I'm Michael Eisner, head of the Walt Disney Company. Robert Urich: Scientific verification of extraterrestrial life forms routinely arriving on earth; top secret reports from ongoing military investigations; compelling home videos of alien craft captured within the last few months; world figures who have gone public with their own extraterrestrial experiences; [and] the shocking history of government misinformation programs designed to prevent widespread panic. Here in the New Tomorrowland at the Walt Disney World resort near Orlando, Florida, these concepts are brought to life as guests experience their own alien encounter, a sensory thriller from Disney and George Lucas. We'll give you a sneak preview later in the show. But first, we must prepare you for the future with some shocking insights from the recent past. There have been reports of alien encounters throughout recorded history. But ... most alien activity on earth in this century seems to have been sparked by the single most profound technological achievement in human history. The atomic bomb did more than blow away every conventional notion of combat. It also saddled mankind with the awesome responsibility of life and death for the entire planet. Note: For those interested in more on this UFO video, see an in-depth article on Disney's significant role in shaping public opinion on UFOs and much more, see this link. 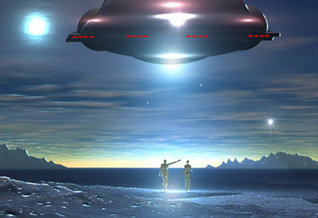 Visit the UFO Information Center at www.WantToKnow.info/ufoinformation.